I first discovered wine at the tender age of nineteen on a trip to Italy — ostensibly to learn how to sing. I spent that summer learning more about Umbrian and Tuscan reds than I did about singing and have been spoiled rotten ever since. It is a terrible thing to be a young musician and a wine snob, but I do the best I can. I moved to Germany a little over a year ago for a variety of reasons. My glib but honest answer when people ask (and they always ask) is “halb für Karriere, halb für Liebe” (half for my career, half for love), and they all nod knowingly. Anyway, one of the unexpected and totally awesome benefits of this move is that I now have access to lots and lots of fabulous wines. At surprisingly affordable prices. All the time. My partner (half of the equation) thankfully shares my obsession. A gifted clarinet player, Doug was born in Massachusetts and moved here about eight years ago, largely for the same reasons I did. Recently, I surprised Doug with a Christmas/birthday/Valentine’s gift of a trip to Alsace for the express purpose of exploring the wines of the region. (Because separate gifts for all of those occasions would be too hard — I’m a terrible person!) This is what we discovered. Alsace is a postcard of rolling vineyards, medieval castles, Renaissance architecture and cheerful, multilingual people nestled comfortably along the feet of the Vosges Mountains. Its wine route wends its way through vineyards and picturesque villages, each of which features at least a few wine cellars or tasting rooms, often where you can talk with the producer him- (or her-) self as you sample the wares. The region is probably best known for its Riesling and its dry, bubbly Crémant which is most often made with pinot blanc, though also occasionally with pinot gris and pinot noir — as well as chardonnay. They also grow sylvaner, muscat and gewurtztraminer here. 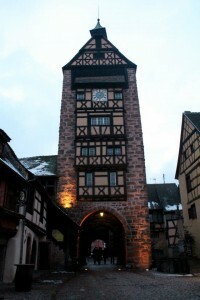 If hiking the entire Route du Vin of Alsace sounds too intimidating, the ancient and charming town of Riquewihr is a great jumping-off point for a more leisurely wander along sections of the Perles du Vignoble footpath leading through the vineyards and other tiny, impossibly quaint villages in this lush region. There is something very special about trying a wine and knowing that you strolled through that very vineyard just moments ago, breathed in the scent of those grapes, that earth. So many cellars, so little time! Though we limited ourselves to cellars within walking distance and managed to try 61 different wines from five different vintners in the course of two and a half days, we barely scratched the surface. Overall impressions: I was most struck by how characteristic the wines of this region are. While they each have their own personality, certain things seemed to characterize most of the wines we tried. If you haven’t been to Alsace, but you know these grapes from other regions, this is what the wines taste like here. Many Rieslings are quite dry, acidic and tart, often with notes of lime leaves and overt minerality alongside the more classic Riesling flavors of apricots and peaches. Muscat: I’m not normally a big fan of Muscat, but the Alsatian variety won me over. I took home more bottles of this than anything else. You get all the things you’d expect — a huge floral nose, interplay between honeysuckle, orange blossom and lychee notes — but none of the (for my palate) cloying sweetness I often associate with this varietal. In other words, all the wonderful bouquet without the overpowering sweetness, allowing the delicate flavors to come through clearly and beautifully. 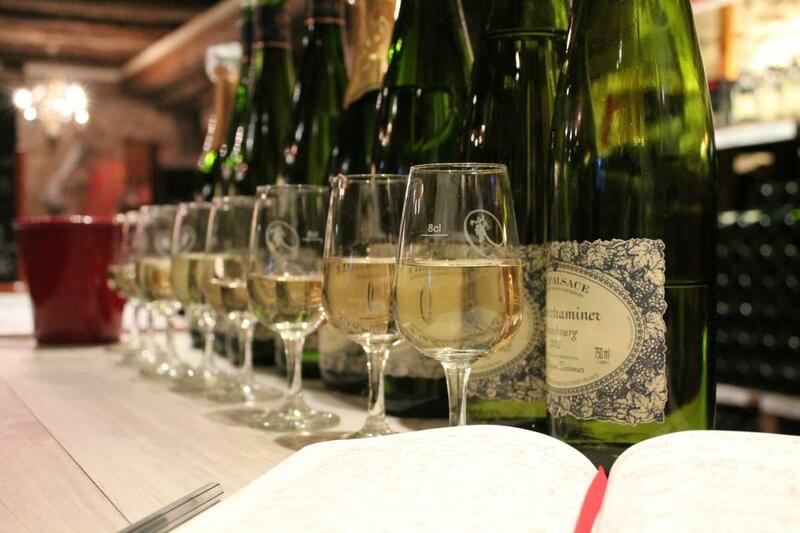 Crémants: the Chardonnays and Pinot Gris are a bit more mellow and have more fruit flavors than the Blanc de Blancs, but they all manage to taste distinctly Alsatian. They are light and crisp, tart and playful, often displaying the same lime-leaf overtones as Rieslings, but the predominant fruit flavors are pear and green apple. Gewurtztraminers are mostly a bit overwhelmingly sweet for my personal tastes, but show very nice elements of lychee, almond, orange blossom and honeysuckle with long, complex finishes. Sylvaner: tart, crisp, light. Nearly all display bright citrus (usually lime) flavors. Once again, the unusual lime leaf note that seems to be very characteristic of this little corner of Alsace pops up alongside clean minerality and occasional green apple. Pinot Noir: after over a year of being so unimpressed with the German Pinot Noirs we’ve come across while living here, we didn’t have high hopes for Alsace. But no! Delicate and subtle, many display cherry and forest fruits alongside vanilla, faint oak, and occasional hints of dark chocolate. Here are the wines that impressed us enough that we took them home, even though we (foolishly) did not bring an extra suitcase, making it quite an ordeal to transport them, even traveling by train. Unfortunately, other than Hugel et Fils, you probably won’t be able to find most of these in the States, but I think they all deliver internationally. This is a small-to-mid-sized vintner, producing about 50,000 bottles a year. It was specifically recommended to us by a friend who happens to be French — and a sommelier. After our visit, Régine Zimmer herself friended us on Facebook. Most wines are on the floral and fruit-forward side. 2011 Muscat: light and refreshing, the perfect apéritif, at 10 euros a bottle this is a fantastic value wine. 2010 Grand Cru Sporen Gewurztraminer: apricot, lychee, honeysuckle, intoxicating mandarin, juicy peach, with undertones of birch. 2006 Sélections de Grains Nobles Riesling: honey, birch, faint earth, white plum—has potential to develop—we bought this one to hold on to. Rentz is another fairly small vineyard and it is dedicated to Viticulture Raisonée, which means they work very hard to respect and maintain the character of the earth, the people who farm it and the environment in general. Despite a family history going back to 1785, it feels very new with a bright, modern tasting room and many of the wines also taste kind of… new. 2008 Grand Cru Schoenenbourg Riesling: we had just walked through the Schoenenbourg vineyard and this wine really impressed us with its explosive fruit beginning (pear and ripe apricot), mineral middle and long blended finish—a cool evolution! Probably the biggest, best-respected and most well-known vintner that we visited, their website boasts, “Hugel production averages 110,000 cases per year, of which around 90% is exported to more than 100 countries worldwide, where ‘Alsace’ is often synonymous with ‘Hugel.’” They have a long and dignified tradition—nearly all of the wines are a cut above, but you pay a premium for many of them! 2010 Muscat Tradition: crisp, with a long floral finish and flavors of pear, lychee, honeysuckle and apricot. 2007 Schoenenbourg Jubilee Riesling: subtle interplay of minerality, apricot and citrus—so well balanced, it’s hard to pick out specific notes—classic Riesling flavors, but beautifully structured. 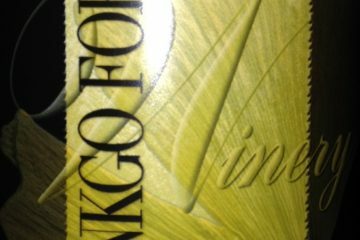 1998 Sélections de Grains Nobles Riesling: Okay, at 76 euros, we didn’t actually take this home… but we wanted to! The nose gives off caramel, papaya, hints of coconut and orange blossom, and the taste delivers with wonderful depth and roundness, blossoming on the palate with ripe papaya and honeysuckle, anchored by earthy caramel. 2007 Jubilee Pinot Noir: Hugel et Fils only makes Pinot Noir in particularly good, “Jubilee” years. We thought that at 22 euros, this one was actually better than the 2009, which sells for €52. An explosion of dark berries followed by a finish of oak, dark chocolate and coffee. This tiny, family-owned company has only been around since 1966 and they are a little off the beaten path, but they are worth seeking out for their fantastic values if you’re like us and love good wine on a budget. In general, they favor a fairly tart, dry aesthetic and their wines are hit-or- miss, but they’re all very reasonably priced, which makes the hits noteworthy! 2011 Muscat: HUGE floral flavors (orange blossom, honeysuckle and wisteria), but surprisingly dry, with mandarin orange and a long finish. At € 6.45 a bottle, it’s pretty outstanding! Like Hugel et Fils, this is a larger (for Alsace) vintner with a long history in the region, and while they don’t specifically claim to follow Viticulture Raisonée, their practices are very similar. We found their wines also had a very tart and dry aesthetic with the addition of lots of minerality and citrus flavors. 2006 Grand Cru Schoenenbourg Riesling: mildly sweet pear and apricot flavors, well balanced minerality and a long, exciting finish of honey, hazlenut and spice. Crémant Brut Medaille D’Or: great value for 9 euros. Not as tart as many of their wines, featuring subtle fruits (apricot and green apple), chalky minerality and a hint of chestnuts. Bethany, what a lovely piece and a terrific Christmas/birthday/Valentine’s Day present for Doug! I recently met Dominique Schoenheitz who makes wine with her husband Henri Jr., at Domaine Henri Schoenheitz in Wihr-au-Val, not far from Riquewihr, your jumping-off point. 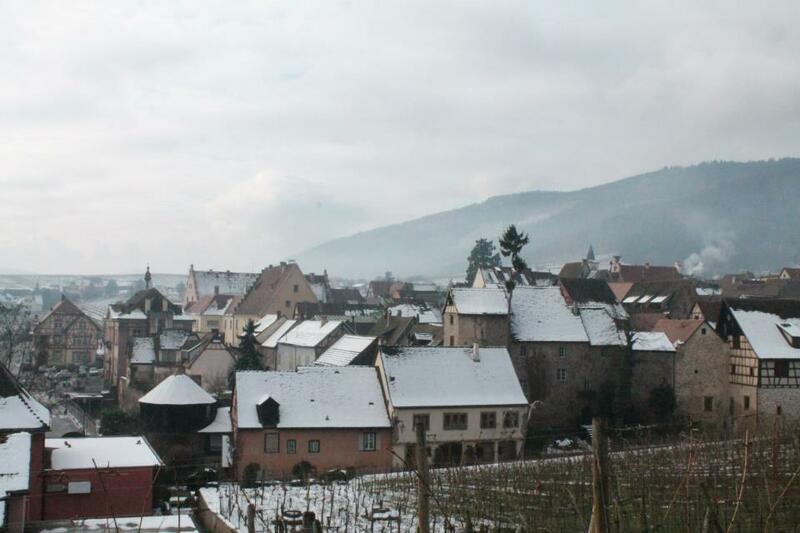 The wines of her commune have been famous since the Middle Ages but the Nazis leveled the village during World War II. Henri Sr. helped rebuild it and replanted vineyards but sold his grapes to a co-op. Dominique and Henri Jr., decided to produce estate-bottled wines starting in 1980. Their high-elevation 2010 Riesling Herrenreben has a laser-focused purity ($24), their 2011 Pinot Noir Val St. Gregoire ( $20) and 2011 Pinot Noir Herrenreben ($28) taste varietally spot on and their Gewurztraminers are spicy and light. They’re available in Boston, New York and Seattle. Lucky Doug!